WILLEMSTAD - George Jamaloodin, former Minister of Finance, refuses to cooperate in his extradition process to his native Curaçao and to be tried as a suspect in the criminal investigation called Passaat. Jamaloodin, the suspect in a series of other criminal cases, has come under the suspicion of forgery during his term as Minister of Finance. It is about the antedating of a ministerial decision regarding the introduction of the tax repayment scheme. His lawyers wanted to terminate the case against their client because Jamaloodin said he was not guilty of any criminal offense. He also said that the case is older than five or six years already. The judge has decided to declare Jamaloodin inadmissible, thus remaining suspicious in the Passaat case and in the other criminal investigations. 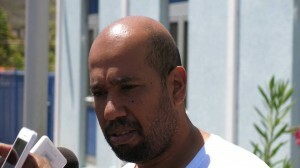 Currently, Jamaloodin is in Venezuela in the hands of Interpol in anticipation of his extradition to Curaçao.